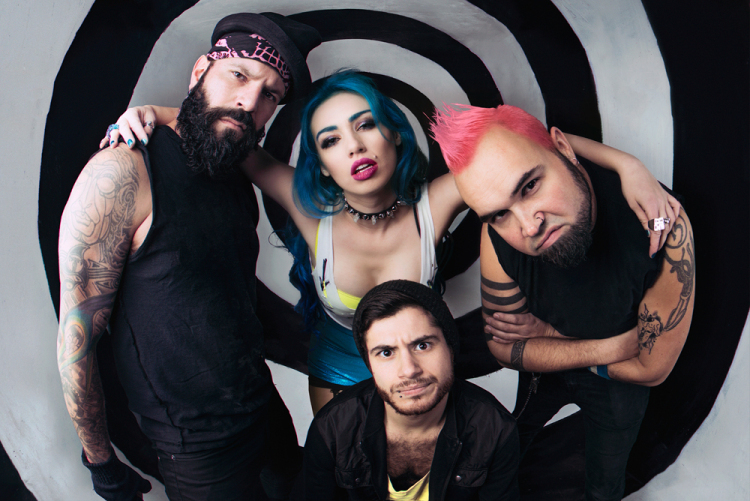 While many fans remember her from her teenage pop career back in the early 2000’s, Skye Sweetnam has since become the lead singer Hamilton-based alt-metal band Sumo Cyco, under the stage name Sever. Sumo Cyco released their second album, Opus Mar, on March 31st via Radio Ghost Music, which they independently crowdfunded through PledgeMusic and surpassed 255% of their original goal following the release of their buzz-worthy single, “Anti-Anthem”. Produced by Matt Drake and James LeRock Loughrey, Opus Mar features a medley of dance-hall rhythms, pop hooks, heavy guitar riffs, and Sever’s vivacious vocals. In our new interview, Sweetnam details the making of Opus Mar, crowdfunding, Cyco City, and more! Opus Mar really doesn’t fall under any specific genre. It’s an interesting medley of different sounds. If you were to classify it under anything, what would you call it? I usually say two things. I either say it sounds like a cheerleader murdering you, or I say it sounds like a lot of really hooky, melodic songs, disguised in a bunch of chaos. As far as genres go, I think I could probably name 10 genres that would have influenced this record. It’s classified as a rock album, but you can definitely hear the pop influences I have from being a pop artist early in my career and paying real attention to songwriting structure. Things like hooky melodies and those kind of things. I’m also super influenced by trying to make things heavy and chaotic. That’s where the more punk and metal sides come in. One of the key elements that separates us a lot from the artists that we play with on the road is adding urban dance hall, so having that beat where it feels like you can really move your hips and groove to it. Then putting my spin on rapping or I call it flowing, in certain spots where it’s very rhythmic vocals and trying to fit in as many words and interesting phrasing as possible. Like you said, it’s not really easy to say in one sentence, but we try our best. When you were putting it together, who were your musical influences? Mainly, I always have to mention them, because one of the main reasons that we’re even a band is because of the band Skindred. They’re popular over in the U.K. and Europe. Benji Webbe from the band ended up doing a song with us on the record. It is kind of a full circle thing, because it was listening to their first record, Babylon, that really got me excited about the idea of doing a really heavy band, but adding the dancehall element in there. That’s what they do so amazingly, make you want to dance and rock at the same time. The main influence that really overrode everything was the fact that we wrote this record in between playing a lot of shows on the road. We’d have immediate feedback from our set and I’d go to the guys and talk about what songs worked really well and what didn’t, how we would’ve changed them if we had the time to be on the road a bunch of months before we wrote the songs. The first record we wrote pretty much without playing any real big tours. I wanted to write this record with songs that we could bring the energy to live and had those moments in the set that go up and down like a rollercoaster – feel really fun and energetic for the audience and have participation moments. That was one of the influences, [but] lyrically I feel like the record is themed a lot around world events. Everything from environmental, social, political, everything that I was most passionate [about] at the time influenced this album. I was having such a great time over the past couple of years growing this project and seeing results of working so hard, playing a lot of shows, and meeting a lot of people. There was really no turmoil in my own life. Everything seemed to be [that] I was just doing my grind, working hard, and pushing through. I think the main thing that I kept getting that bubbly anger [from], or tension, was all of these world events happening around us. There’s everything from… even recently, terror attacks happened when we were playing London and previously we were playing Paris the week after the Bataclan attacks happened. There are a lot of world events that I felt were affecting my conscience and me. That’s where a lot of the lyrics come through. They sound a lot happier when you listen to the record than they actually are. They deal with suicide and bullying and all of these different issues that are pretty heavy, but I do it in a way that I think I always have, [with] that silver lining of hope in the songs. Being able to overcome these obstacles. I think that’s pretty important, because it is really dark, and there’s enough music out there that has that theme. It’s music where when you’re sad, or you got bullied, you go home and you listen to something that deals with it in a dark way and you sit there and cry. But listening to something like you were saying that still touches on it, but is happy, it takes them to a different place. Yeah. I think so. I really want to make sure that people, especially in our community and our fan base, we take a lot of pride in talking and messaging all of our fans back, so I really want to create a community that is very positive. We started a street team recently, groups on Facebook and stuff, it makes me so happy to see people becoming friends through our band. I had a friend from Germany and a friend from Barcelona who were both fans of the band that came and met in London and I introduced them to each other and they ended up becoming super close. To me that’s super magical, seeing those bonds and that community that we like to create. People can feel free to be themselves and that everyone is supporting each other. I love seeing that.